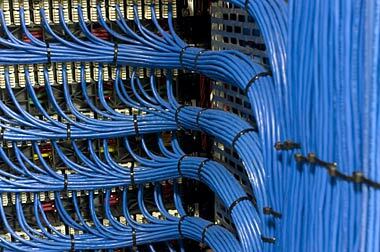 Our structured cabling department specializes in installing both infrastructure and work station cabling. We offer Category 3 and category 5 for voice services and depending on equipment requirements, category 5e and category 6 for Data services. We will work with you to successfully install a complete and easy to manage cable infrastructure. To accomplish this, our cabling technicians install cable in a neat and orderly manner, label and document all cable runs for both voice and data work stations, ensuring an easy way to maintain and manage your cabling infrastructure for future diagnostics. We strictly follow TIA/568 standards using only Leviton voice and data products www.levitonvoicedata.com.